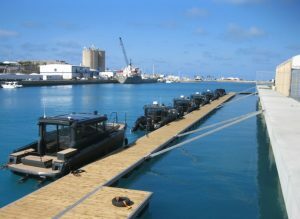 Dock manufacturers provide the main infrastructure for the marina industry. Many are international leaders in design, groundbreaking material production and creative structures, and masters of the business of permitting and approvals. Most, if not international super stars, are leaders of their niche of the industry and driven by satisfied customers and the growing number of slips from coast to coast. 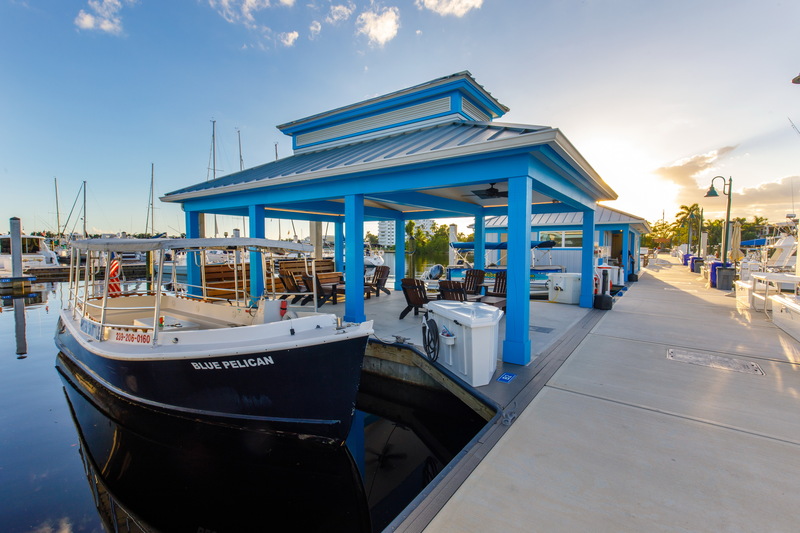 Here dock builders talk about what trends they see from their customers, how they steer industry trends through innovative design, and where the industry differs among the vast types of marinas that require a vast number of dock options. Dock trends are often dictated by the boats that inhabit the slips. In many places, the trend for boats is still bigger and bigger. In the Gulf Coast, Southeast Atlantic and the Caribbean, the market continues to grow for larger boats and megayachts. Many marinas are catering to larger and larger megayachts, which require immense dock structures and custom dock equipment. population of those vessels has greatly increased over the last 15 years,” said Steve Ryder, who works for Bellingham Marine in those southern markets. Even marinas that are designed for 40- to 60-foot boats, those designs often include boat lifts or the need for wider slips to accommodate larger beam outboard boats – 65-foot outboard/center console boats with multiple engines are now a regular part of the marketplace, which requires different infrastructure than boats of the past. Bob Berry at Marintek has seen a growth in the catamaran market. Space to store these vessels, which don’t fit in typical slips, is hard to come by at some marinas. Marintek also caters quite a bit to megayacht marinas, which need side-tie space. Catamarans also need special design considerations to fit the wide vessels in side-tie slips. In some areas, regulators play a big role in how marinas can configure slips and what size slips can go into the water. On the West Coast, where Eric Noegel with Bellingham Marine focuses, he said many of his clients would like to have larger slips than what they have. “The pressures from regulatory agencies make it difficult to reduce the number of slips in a typical marina due to the agency’s concern about limiting public access, even when occupancy is low,” Noegel said. Sometimes it’s easier to replicate what facilities have to appease agencies and permitting. Where marinas can’t build larger docks but need to accommodate larger boats, American Muscle Docks has built systems with narrow fingers and longer docks to widen berth areas. To make fingers stable, this often requires additional piling at the end of finger piers or more solid connection points. Although the trend for larger slips is not going anywhere, some builders have also seen a resurgence in smaller slips. Tiger Docks, which works mainly at inland lake marinas, has seen a similar trend toward smaller and wider slips. Nick Davis, Tiger Docks COO, said, where marinas were wanting 40-foot by 15-foot wide slips, now they’re installing 28-foot by 12-foot wide slips. MariCorps US, which also works in fresh and brackish water marinas, has noted an increase in demand for smaller slips. The trends in dock material choices as builders see them often depend on the builder’s capabilities. However, certain changes in material composition have influenced the market as well. American Muscle Docks builds galvanized stainless steel, aluminum and wooden docks. Some customers still choose wooden docks because it’s the cheapest, said Luke Diserio of American Muscle Docks. “Aluminum has also come a long way. A lot of people are building heavier aluminum docks,” Diserio said. Processing technology has made aluminum better and more suitable for saltwater, and American Muscle Docks has used aluminum in ocean environments now, where it wasn’t before. 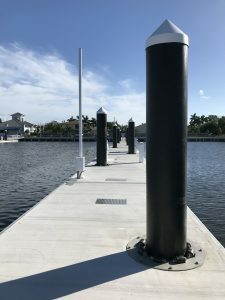 MariCorps also produces a galvanized steel dock system, or a hybrid steel/concrete design, which allowed a marina to put in a swimming pool in the docks. The trend for stainless steel docks, Ashby said, is from a painted steel to galvanized. Push arm hinges, installed by Structurmarine, were used for the America’s Cup docks in Bermuda. material availability and technological advances. Regulation has pushed the need for fully encapsulated foam floats, particularly in Dade, Broward and Palm Beach counties in Florida. New codes there prohibit exposed or coated foam; it must be in a polyethylene or concrete shell. “Foam beads on the water due to exposed foam will soon be a big cost for cleanup for marina owners,” Ryder said. He said that area is also experiencing an active storm cycle and more severe hurricanes in the last few years. Structural walers have gotten bigger, and float modules with more reinforcement and connection frames using heavier sections of steel are more common, Ryder said. Bellingham also uses fiberglass rods for its thru-rod system, which eliminates the use of 80 percent of the steel in the system and some maintenance costs. Other dock builders are using other newer and innovative waler designs. Golden Marine Systems has changed from a wooden waler to an aluminum waler. “It’s higher strength. It’s sort of a hybrid system,” said Mike Shanley of Golden Marine Systems, which manufactures aluminum and concrete docks. Instead of waler-style concrete docks, SF Marinas is installing a lot of docks with single pass concrete structures. It is one solid structure that does not require bolted walers. Gael with Structurmarine explained how design choices can be influenced by the project cost vs. understanding the total cost of ownership. Many owners are only looking at the initial price tag, not the total cost of ownership, which considers maintenance 30 years down the road. With projects that acquire subsidies, such as funds from the Boating Infrastructure Grant program, a full RFP (request for proposal) process is necessary in order to sign a contract. “It’s tough to bid the total cost of ownership on a project,” Simon said. Many owners are only interested in the initial cost and educating them about the total cost of ownership is difficult in a closed bidding process. “We’re trying to educate consultants,” Simon said. “They’re the ones writing the applications for the grants, so if they know their choices will have an impact on the long-term cost in greater numbers, than how it will impact the initial cost, we can sometimes make that argument,” Simon said. As with dock design, contractors are designing and building larger and larger breakwaters and floating attenuators. The bigger attenuator designs also allow for more dockage space. Large floating attenuators protect the existing facility and can expand on the size boats the facility can accommodate. “You’re getting two wins, that being protection from wave energy and gaining more from transient business,” Sears said. Floating attenuators can typically provide good protection at a better cost than fixed breakwaters. “Protected sites for new marinas are very rare these days, so just about every new facility has to take into account wave energy,” Ryder said. Fixed breakwaters are also often more difficult to permit and, in many cases, can’t provide mooring for vessels. The trend for breakwaters, Noegel said, has long been post-tensioned construction with multiple heavy-duty concrete modules, which is a good method for creating a rigid enough floating beam to knock down waves. Marintek also manufactures heavy-duty concrete breakwaters, which Berry said are growing larger and larger. He has heard a common story from marina owners who have been in the business for decades. They used to serve 25-foot boats and now they have 55-foot boats that throw a three-foot wake. “They need a concrete breakwater, where they didn’t need it in the past,” Berry said. The trend for decking, by far, according to dock manufacturers, is the use of composites. “Everybody is going to composite,” Diserio said. He noted that the newer composites don’t get as hot as they used to and are more structurally sound, than older composites. Concrete tile decking still has a place in the market too. While Tiger Docks does a lot of composite decking, it also uses concrete tiles with its galvanized steel system, or a hybrid concrete/composite system. “Concrete tile is more cost effective than doing all composite,” said Jason Howarth of Tiger Docks. The concrete tiles still have good longevity. The hybrid system uses a composite band board with concrete tile decking. MariCorps also continues to rely heavily on concrete tiles for projects. Structural improvements in the fibers and additives are making the concrete last even longer, Ashby said. “The concrete tile is no longer something that’s used only regionally in mild climates. We’re even using concrete in cold weather environments,” she said. Composites are big for anchoring systems too. Tiger Docks, which builds mostly on freshwater, has seen changes in the water environment that has affected material durability. “Carbon dioxide is more prevalent in the water, making cables not last as long as they used to,” Howarth said. He said more marinas are turning to composite, elastic systems like Seaflex, over steel cables. Piles still reign supreme in many parts of the country. Steel and concrete piling are the most common choices, and the structural design very much depends on site-specific conditions. “The traditional structural pile being used are prestressed concrete and steel pipe piles. The choice of pile type is generally determined by the soil report,” Ryder said. In softer soil conditions, generally, the material cost for concrete is less than steel. In harder soil conditions, such as rock, compacted sand or limestone, steel piling are generally a more economical option. Marintek also uses steel or concrete piles. For its big megayacht projects, steel is the only option, Berry said. For a project with less load requirements, pre-stressed concrete will work. HDPE sleeves covering steel pipe piles installed by Marintek at Seahaven Superyacht Marina in Dania, Florida. Pole mounts for Wi-Fi and surveillance cameras, another increasing trend, can also be seen in this photo. have to do something to it to keep the rust stains down,” Berry said. Several builders pointed to the growing trend of HDPE pile sleeves, which cover piling and protect from oxidation. The sleeves are very expensive, Berry said, but the benefits are two-fold. “It hides the steel and all you see is the HDPE, which holds a color, but it protects the steel too,” he said. “If it’s done right the sleeve should go all the way to the pile cap and be welded to the cap, and the sleeve should go down into the mud line a couple of feet.” This won’t entirely seal out oxygen, but it will minimize oxygen exposure and make the steel last much longer. Structurmarine also uses push arm structures, which are attached onshore and hinged to allow docks to rise and fall with water levels. Bruno Nolet of Structuremarine said the push arm anchor system is good for certain sites. It requires a seawall or shoreline to run parallel to the dock, where the push arm attaches. It doesn’t require heavy machinery or driving piling so it is very cost to install. Dock builders almost unanimously cited non-powered craft as the largest trend in dock extras or infrastructure. On the East Coast, Diserio said that the standup paddleboard and kayak market is really growing. Facilities want both individual kayak docks that fit in slips and separate low profile kayak docks and launch areas, as well as inland or on-the-dock storage racks. Tiger Docks has built several kayak and paddleboard centers, an enclosed building for storing paddleboards, kayaks, life jackets and more, which is attached to the side of a courtesy dock. Kayak launches are a popular part of that design as well. SF Marinas is seeing more LED lighting in use, unique fendering materials other than wood, and massive bollards on huge docks housing massive megayachts. “A 10-ton bollard used to be a pretty big load, but now you’re getting 30-ton plus for larger vessels,” Sears said. 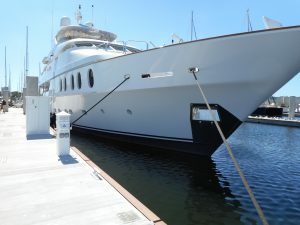 Dock designs are also integrating in-slip pumpout systems that run below deck for a clean look on top, and some of the larger megayacht facilities are using forced pumpout lines. This uses a separate pump on the vessel or a mobile pump that pushes the discharge from the boat to the pumpout system, rather than the pumpout system sucking from the boat. Customization is prime for high-end facilities. Bellingham uses concrete docks with stamped decking, aggregate finishes and other unique aesthetic choices, Noegel said. Other trending accessories include in-slip pumpouts, high-end Wi-Fi and GFI monitoring at pedestals. Ryder said Bellingham is building many facilities with extra shoreline amenities, such as pools, owners/captains’ rooms and workout areas. Boaters are looking for more at the docks in some cases, Ashby said, where MariCorps uses floating structures at the docks for showers, laundry, dining and shopping. “We are building a lot more floating foundations,” Ashby said. Two-story buildings are also a popular amenity at marinas, who like them for the ship store and office. The choices for dock materials and structures continue to expand, but the right choice is site-specific. Marinas should do their homework – investigate material choices, anchoring systems, engineering and environmental concerns, contractors, and their boaters needs for now and the future. The investment for docks is a big one and to make a strong return on that investment, docks need to do the job for a long time. Dock manufacturers have long led the industry with innovative materials, solutions to problems and sound advice to marina owners. Part of finding the right dock might also mean finding the right dock builder for a facility.